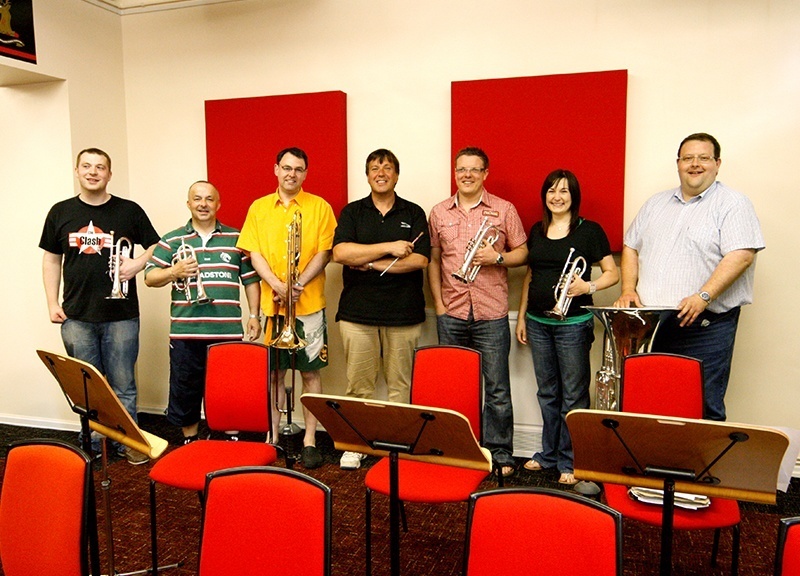 Back in April 2007, Amadeus Acoustic Solutions were invited by Dr Nicholas Childs to visit the historical Black Dyke Band Headquarters and assess the acoustics within the brass band’s existing rehearsal space and to decided what improvements could be made so that when their new band room was ready it would deliver an acoustic required by this world famous Brass Band. 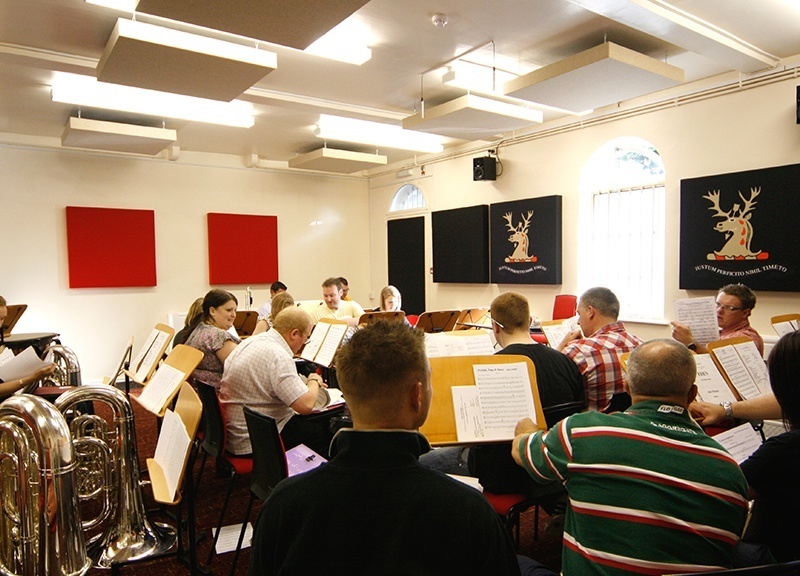 Established over 150 years ago, The Black Dyke Band are one of the worlds most celebrated and illustrious brass bands and have a history like no other, with a myriad of awards, achievements and accomplishments under their proverbial belt. Their affiliation with The Beatles is a nice place to start. They recorded an instrumental version of ‘Yellow Submarine’ for The Beatles in 1968 which was later used as a b-side for one of the bands famous singles. They later worked with Paul McCartney on a track for the Wings album ‘Back to the Egg’ in 1979. Their collaborative work with international superstars doesn’t stop there – the band have also recorded with Peter Gabriel, Tori Amos and The Beautiful South. When opting to reside in slightly less Rock ‘n’ Roll but equally prestigious circles, they still find time to tour the world collecting cabinets full of trophies and awards along the way. 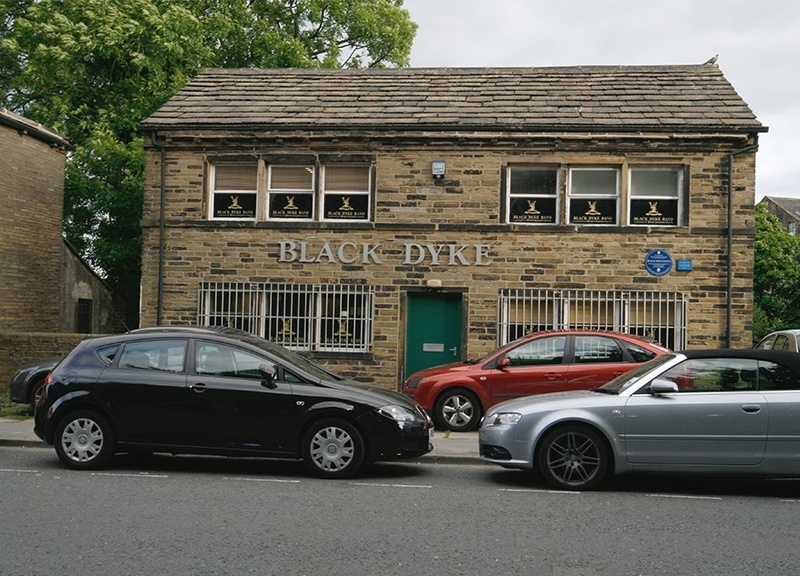 Black Dyke was the first band to achieve the “Grand Slam” in 1985 by winning the Yorkshire regional, European, British Open and National Championship contests. They were also voted BBC Band of the Year. In August 2009, the band undertook a tour of Australia with multi-instrumentalist James Morrison which culminated in a concert at the Sydney Opera House. They are lead by the charismatic Nicholas Childs DMA, MA, FLCM, ARCM (Hons), whose CV boasts success of monumental proportions. John Locke of Amadeus under took the initial mission and travelled to meet Dr Childs and visit the band room. John briefed our acoustic consultant taking full account of the proposed plans and worked in collaboration with the project architect. 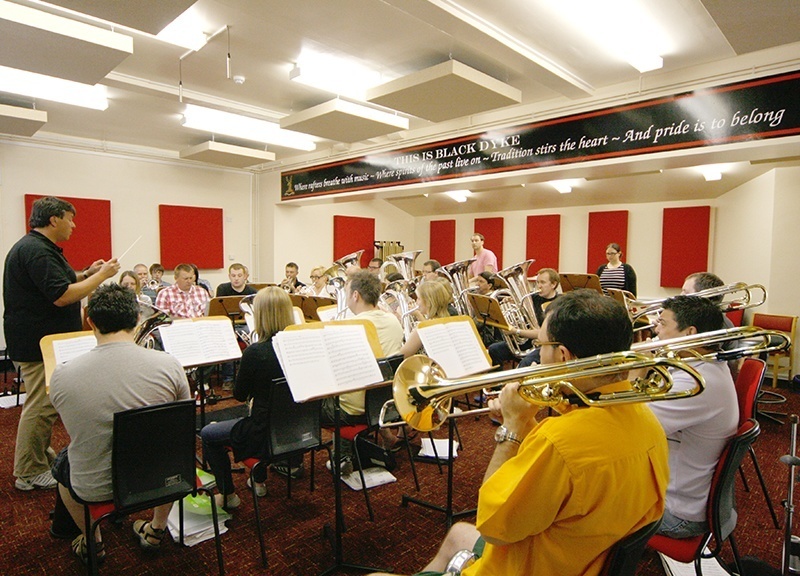 It was determined that we were faced with a difficult task – considering the size of the band, and the fundamental nature of the brass instruments, the new band room was less than half the size of that which we would recommend / design for acoustic purposes. Nonetheless, seldom are we presented with a set of ideal circumstances, and resolving a problem such as this is exactly what we do best. 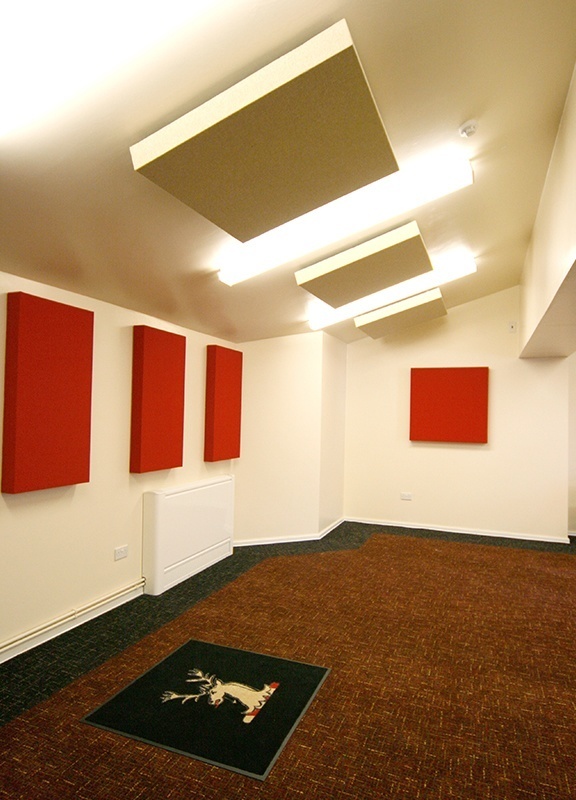 By strategic placement of acoustic absorption panels around the practice room to reduce the Reverberation Time (RT) from 3 seconds down to just over 1 second. 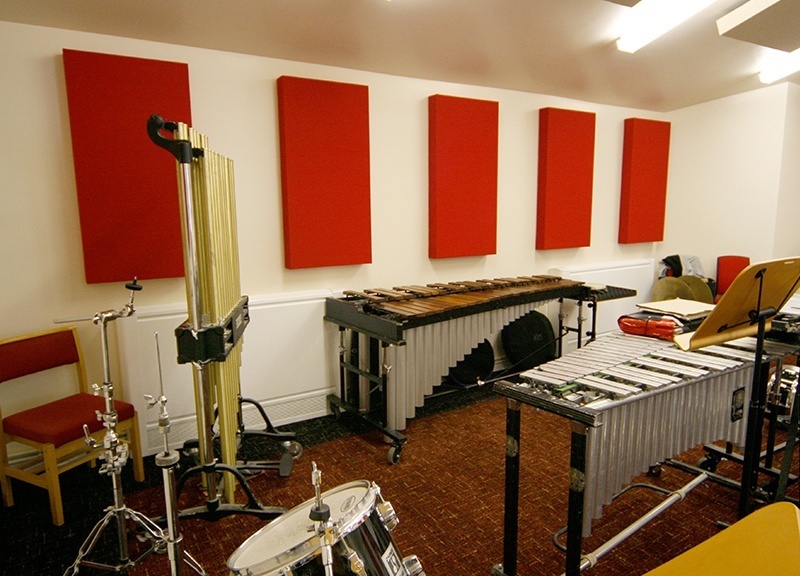 A combination of acoustic panel types, dimensions and positions were established to give as near optimum performance as space and budget would allow. 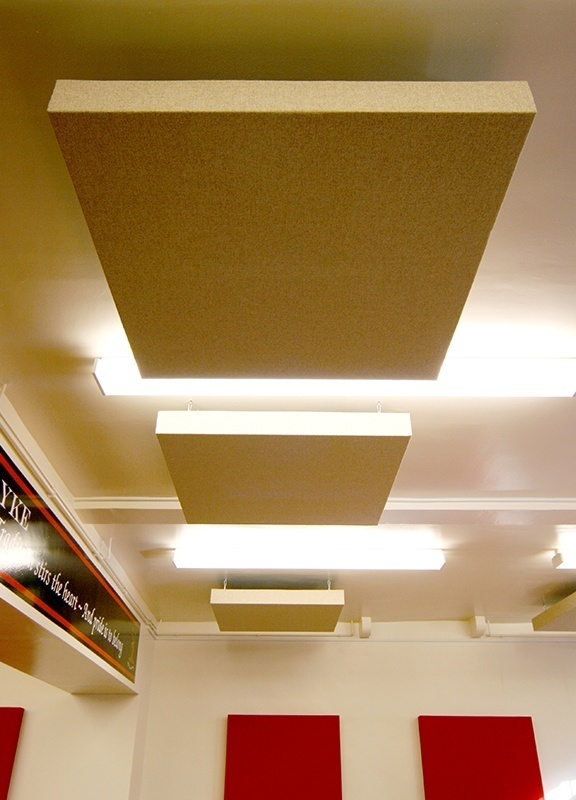 The variety of images show fabric covered Absorbor ™ & B.A.D ™ panels which ensure an RT of around 1 second at mid and high frequencies and 25% more at low frequencies. 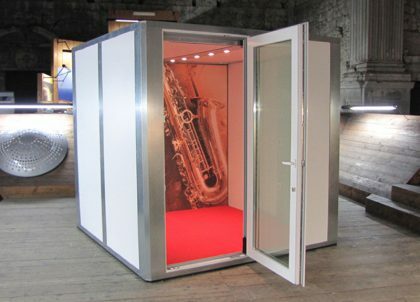 The band also use RAT Concert stands and the Opus 1 musician posture chair, available from Amadeus. The chair featured below was custom made for the Black Dyke band, covered in a beautiful red leather. 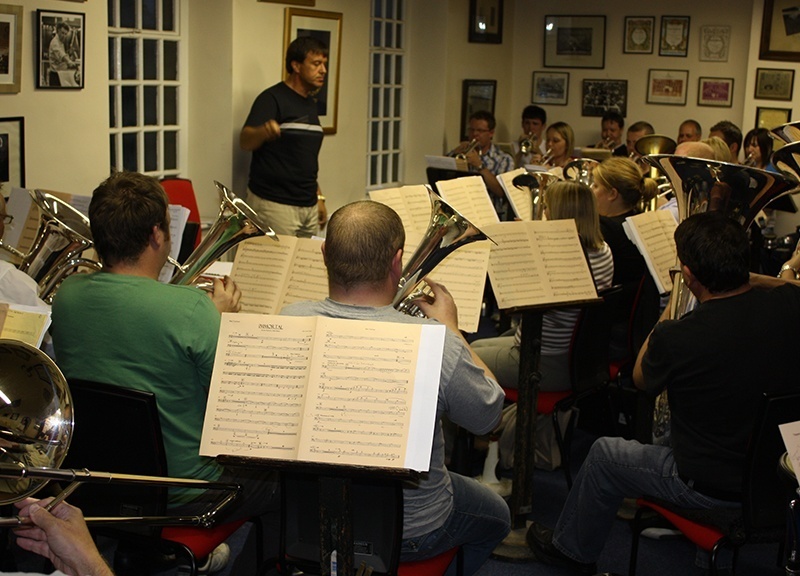 The work was eventually carried out in March 2010, and the band rehearsal room works well and looks very impressive, being used for the first time as recently as July 2010 and proving to be a great success. When we carry out an installation such as this we place equal importance on both the acoustic effectiveness of the treatment and the aesthetic appearance of the interior design. As the pictures show, the installation looks wonderful. 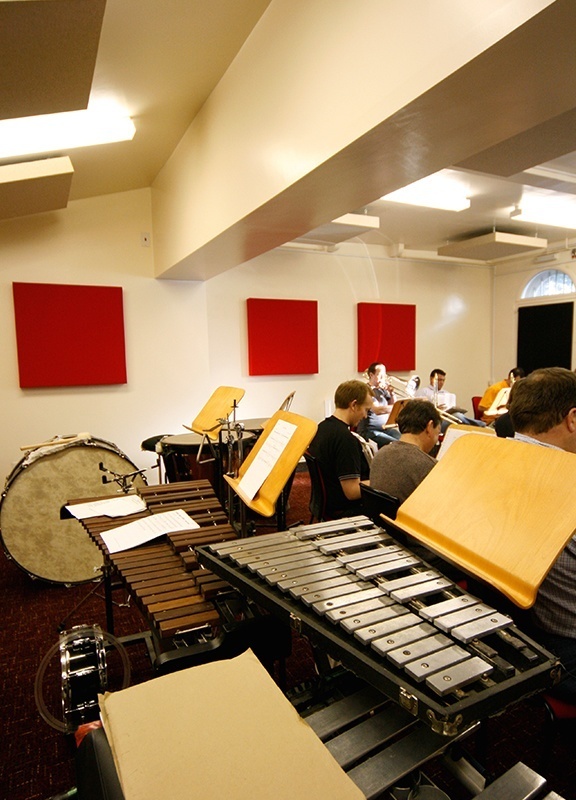 We consulted with the client regarding the colour scheme of the panels, to achieve an overall ‘feel’ that suited the band and the room itself. 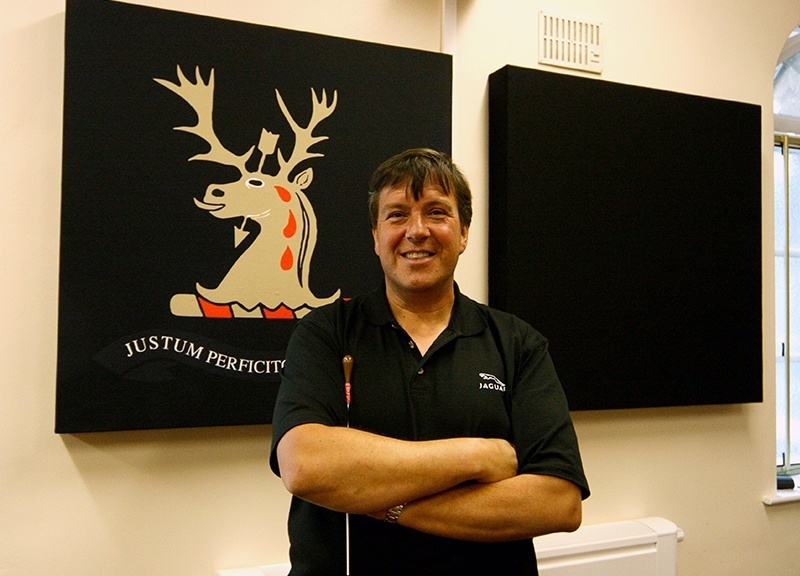 The perfect finishing touch was provided by printing The Black Dyke Band logo on two of the panels, which we all agreed looks stunning.